There’s something a bit funny about me posting a recipe for a fish dish because I never really had a taste of seafood until a few years ago. My husband loves fish and slowly got me to taste it when we would go out to eat at restaurants. Now I’m a seafood lover –I’m thankful he broke me of that picky-eating-habit — but cooking fish at home has been intimidating for me! I’ve experimented though and finally cracked a good basic recipe of baked cod that I then mix up with different toppings (kalamata olives and tomatoes is a favorite!). 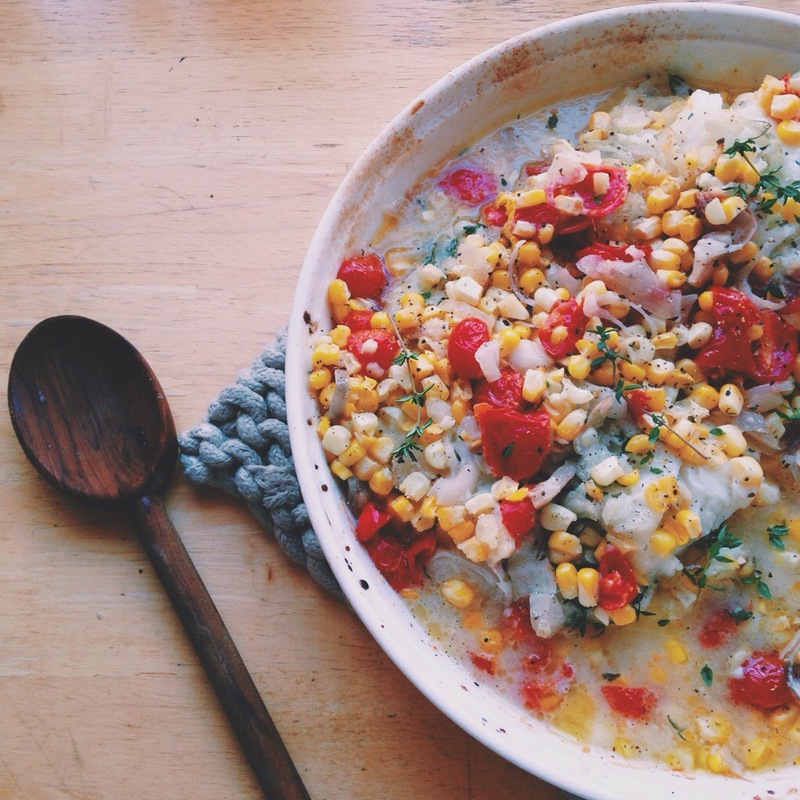 We saw some sweet yellow corn at the market this weekend and I decided to experiment with a baked cod dish that has a summer spin: corn, tomatoes, shallots and thyme — full recipe below! 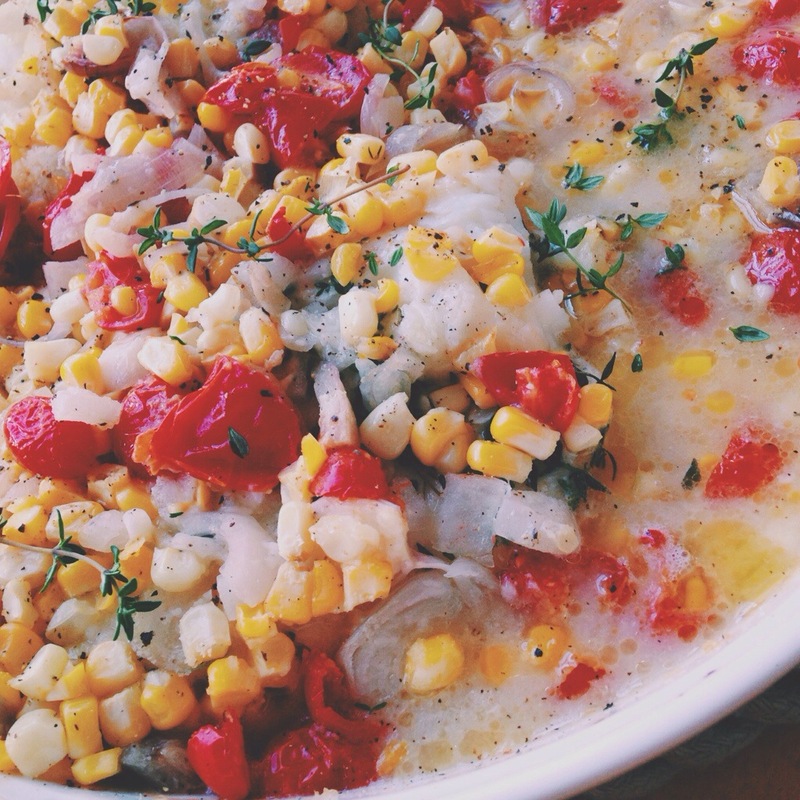 Preheat oven to 425 degrees, and in a shallow baking dish arrange the pieces of cod. On top of the fish, pour 2 tbsp of white wine, and then sprinkle 2 tbsp of grated Parmesean cheese. 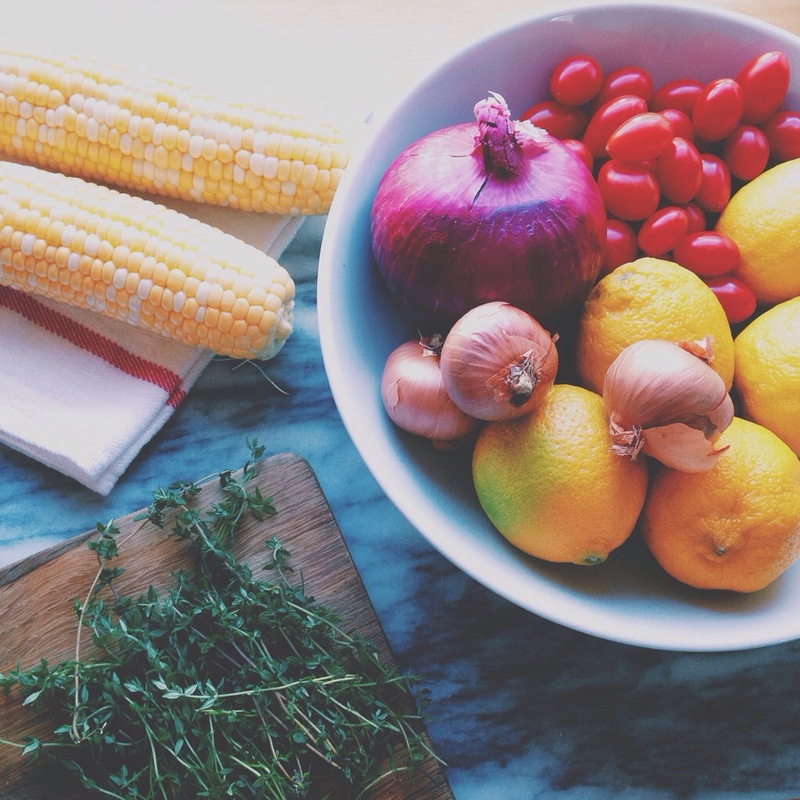 Next, arrange 1/2 cup of quartered grape tomatoes, 3 thinly sliced small shallots, and corn kernels from two ears of corn. Top all of the ingredients with a generous amount of salt and pepper, 6-8 fresh thyme sprigs, the juice of one lemon and 1 tbsp of melted butter. Pop that tasty summer dish into the oven and let it bake for 15-20 minutes, until the fish is cooked through. 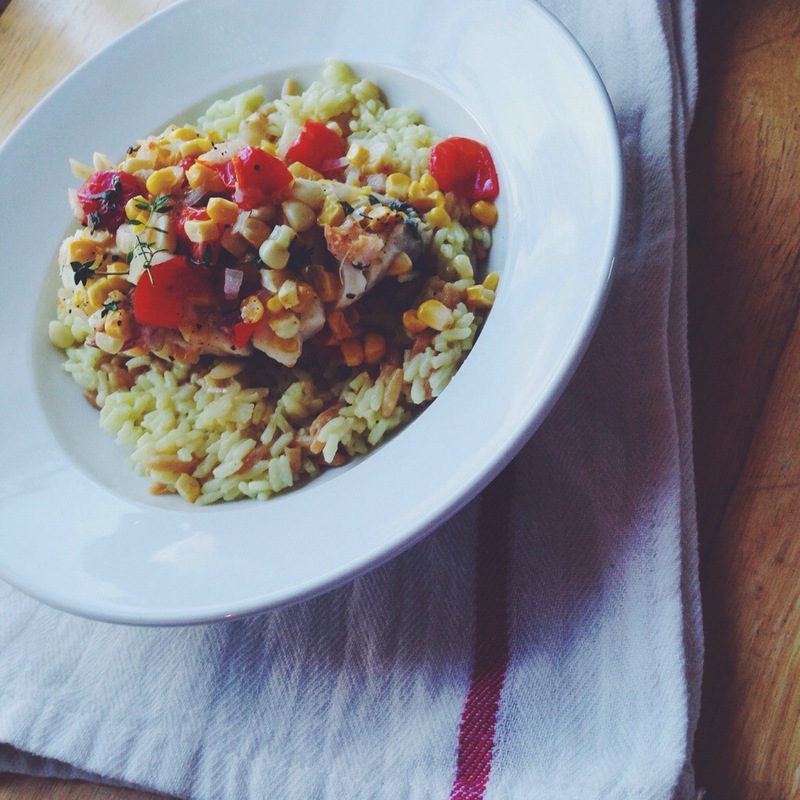 Serve over rice with fresh thyme. Plymouth Cheese Company. Everything Bagel Mac & Cheese. 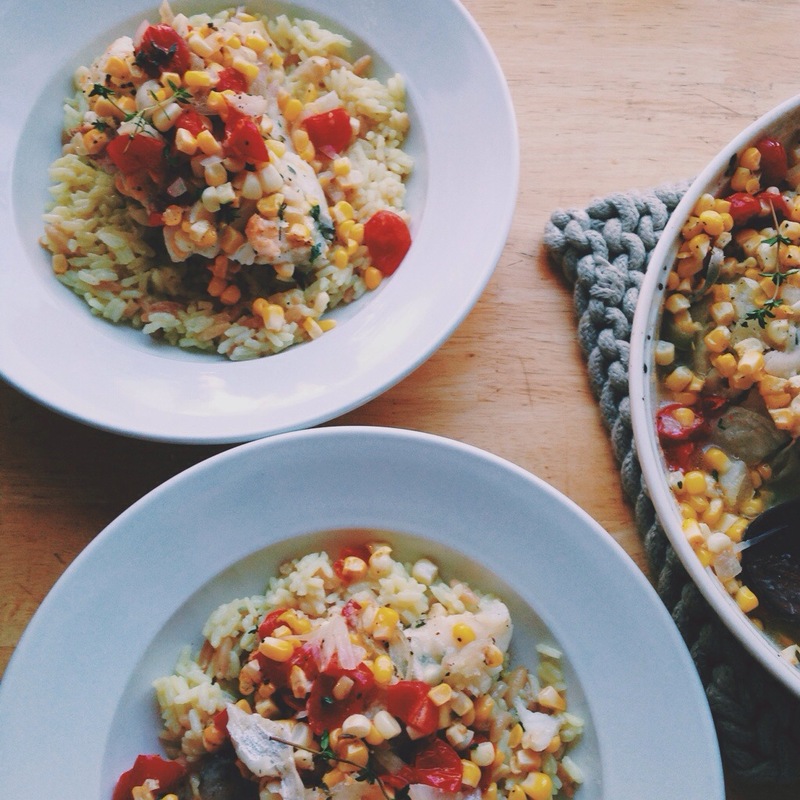 9 Responses to "Baked Summer Cod." Delicious recipe and beautiful photos! Stunning! I love the colors and I bet it tastes amazing! yum this looks good! the colors are so fresh. I didn’t eat fish until a few years ago either and this looks fabulous. and easy. my big problem is buying fish – where to go?? I just may have to make this! It looks so yummy :)!